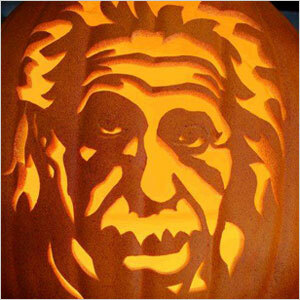 Einstein would have been a giant pumpkin growing genius, because he understood one of the basic premises of pumpkin growing. That is that everything is relative to the growers position in the universe and how well their pumpkin plant is growing. Sometimes as growers we are too close to the plant. We are over watering, over fertilizing or under watering or under fertilizing because we get too focused on the one thing or the wrong thing and as a result we are missing what would be obvious to everyone else. I often find that "slow" plant growth or pumpkin growth is sometimes relative to what I want rather than the reality of what is happening. I can't count the times that it seemed like early in the season that the vines are growing slow until I looked at a picture of my plant on this pumpkin blog (I'm this blog's #1 reader) from 5 days before and only then realized how much the plant had grown. It is all relative. This perspective in pumpkin growing often makes us a "moreon" (pronounced moron). I can't count how many times, after seeing another grower's big pumpkin the grower goes home and pours on a bunch of fertilizer on their plant. Often times "more on" doesn't work. A perfectly happy plants lives in a space between just the right amount of water, nutrients, sunlight and warmth where everything is working in balance and harmony so a plant wants to grow. As Goldie Locks will tell you, too much or too little doesn't work. It all has to be just right. So this is my pumpkin growing tip of the day. Don't be a moreon. Start by researching everything you can about how to create a great, balanced soil. Then get a soil test, do plant tissue testing, do soil EC testing or whatever you can afford to find out what your patch has and what your plant needs. After that, develop a pumpkin fertilizing program and put it on paper. List what you will give to your pumpkin plants each week in spoon size amounts. Doing this will allow you to give the right amounts of the right types of fertilizers so you don't become a moreon. Doing this will allow you to focus on your plant and not get distracted by what others are doing or anxiety. Next, make proper adjustments to your fertilizer program based on what the plant is telling you and the weather. A good fertilizer program should be a guide, but not a hard rule. Use your experience and what the plant is saying to guide you in what you do. If you are inexperienced, than follow my fertilizing program and talk to other growers and ask them for their tips and advice. Lastly, even if you are experienced grower, ask for other growers opinions. Like I said before, sometimes you get too close to the plants and you are missing the obvious. Or someone might have some good tips for things you never thought of. Just this week I asked advice of a grower for things that I was pretty sure I had the right answer for but I wanted to be sure. Getting a second opinion sometimes sparks new ideas and keeps you out of trouble. 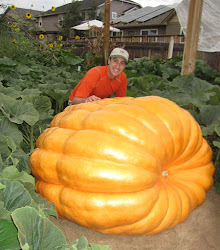 All of this will allow you to be an Einstein in the pumpkin patch and grow your biggest pumpkin yet.